In this tutorial, you'll learn how to enable product recommendations as well as how to implement recommendations in your email creative how to use merge tags to dynamically inject product recommendations into your HTML templates. Recommendations are made up of the top selling products across your entire catalogue as defined by your customers' purchase behavior. 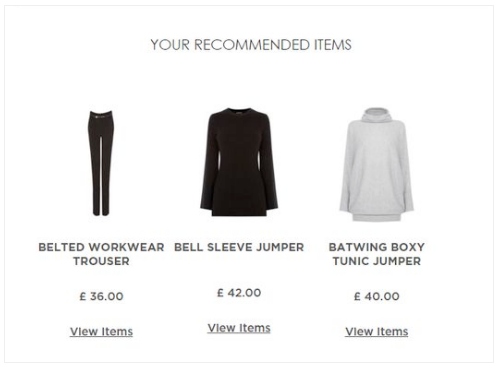 Our recommendation algorithm predicts what products your customers will want to buy next and intelligently serves these items in your email campaigns. We've made it very easy to recommend products based on browse activity and cart data to help you increase your CTR and revenue per email. 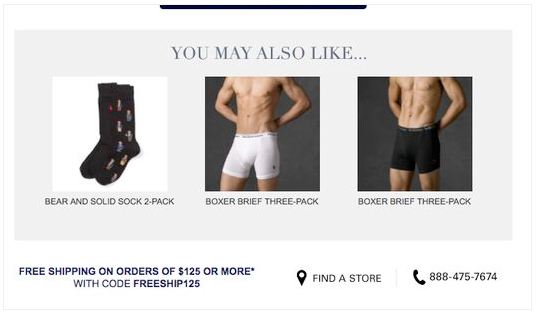 Below are some examples of product recommendations in email campaigns. To learn more about how to strategize your recommendations click here. We've made it very simple to manage your recommendations in the application. It's important to know that in order to start using product recommendations, you must first make sure that these are enabled in your account's Settings. To see your recommendation settings you will need to go to your account settings and then click on the Recommendations link at the top. Next, you'll need to use the toggle to enable or disable the use of recommendations. If the toggle is red, your recommendations are disabled and no data is being collected. Once you've enabled your recommendations, the application will start collecting user data, all while learning about the most popular items to recommend. Aggregation timeline: this setting allows you to manage the timeframe which the app should consider in order to define your catalogue's top sellers. Products to Exclude: this setting is useful for suppressing items that you do not want to recommend. 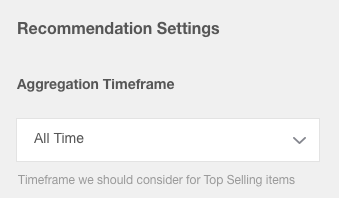 This setting helps us determine the timeframe you'd like to use for your product recommendations. The default is "All Time" where we look at your all time top sellers. You are able to change this setting to a more fitting timeframe depending on your business type and product catalog. 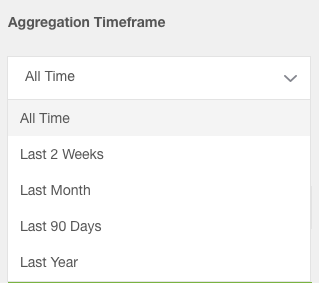 So for example, if you would like your top sellers recommendations to reflect ONLY the last month, you should select the timeframe of "Last month" to make sure that we're injecting the overall top sellers of the last 30 days. After making your selection you will need to save your recommendation settings by pressing the green button at the bottom. You can suppress certain items that you do not wish to feature in your recommendations. Go into the "Products to Exclude" section of your Recommendation Settings. Inside the input simply start by typing the product ID (SKU) you wish to suppress. A list of available items under the ID or product name you type will populate to help you make a selection. You can either select from the list or add a product to the suppression list by typing the product ID, or the product name. Note that you list population is case sensitive. The product ID and product name of the items you suppress will be visible in your "Excluded Products" list. You can always click on the x next to the product name in order to remove from the suppression list. Note: The product exclusion feature will only auto-populate for products that have been converted. Meaning that we will not recommend low-sale items to your customers. Once your suppression list is ready, you'll need to save your recommendation settings. Otherwise, you will lose your exclusion settings. We define recommendation types as the product “taxonomy” we want the recommendations to follow. Below is a listing of the types available, their definition, and their type usage. Other items that customers have also browsed based on a customer's browsing session. Top selling items based on the categories of products viewed during a customer's browsing session. Tag attributes are those that relate directly to the product’s makeup/content. These attributes are part of the recommendations merge tags that will determine what you’d like to inject into your template. Note: It is highly unlikely – if not impossible – that Rejoiner won't generate recommendations for your Overall Top Sellers. For that reason, we tend to recommend using this type as your fail-safe.